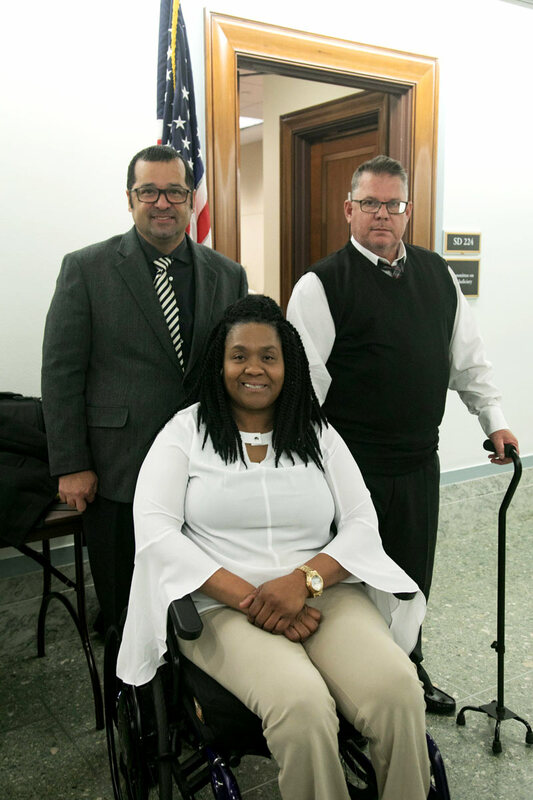 Retired Officer Pete LaBoy (left), Detective Lani Pinkney (center) and Lieutenant Will Rogers (right), all of whom have been injured in the line of duty and have received benefitted from Code 3 support and advocacy efforts. According to the most recent Law Enforcement Officers Killed and Assaulted (LEOKA) report issued by the FBI, 118 police officers were killed in the line of duty in 2016. Additionally, 57,180 officers were assaulted in the lien of duty, with nearly 30 percent of those assaults resulting in injured officers. Presently, benefits for police officers who have been injured in the line of duty are managed locally and vary widely from state to state. The Public Safety Officers’ Benefits (PSOB) program, established by Congress in 1976, is the only federal resource available for injured law enforcement officers and the families of fallen officers. This program provides both death and disability benefits to eligible public safety officers who have sustained fatal or depilating injuries in the line of duty that prevent their return to work. At the time, the receipt of a one-time payment was deemed sufficient to supplement resources provided to injured officers at the state level. However, after hearing the stories of many police officers who have outlived the benefits they’ve received or are unaware of the resources available to them, we believe there is a significant breakdown in our nation’s benefits system for injured officers. We believe the biggest challenge to public safety officer benefits in the U.S. is the absence of a federally mandated minimum standard of care. Currently, there is a wide degree of variability among state-level benefits available to injured police officers. As a result, police have no assurance they will receive a reasonable level of care if they are injured on the job. We educate injured officers about the benefits available through federal, state and local resources. We provide one-on-one counseling to injured officers and their families about the benefits available to them from public and private sources. Our team of volunteers works directly with impacted families to navigate the complex and often cumbersome process of securing medical, disability and retirement benefits. We equip injured officers with resources to address their immediate and urgent needs. We offer short-term financial support to help relieve injured officers of medical debt, the high cost of daily living aids not covered by medical insurance (e.g. wheelchairs and handicapped vehicles). We empower injured officers to get back to work so they can regain economic independence. Through our academic, corporate and nonprofit partnerships, we identify vocational opportunities that help injured officers pursue new careers so they can become self-sufficient. We know this problem is complex and cannot be solved with a quick fix. That’s why we’re calling on Congress to take immediate action to address the long-term care needs of first responders. Commission research to determine the amount of medical care needed by injured officers over their lifetime. 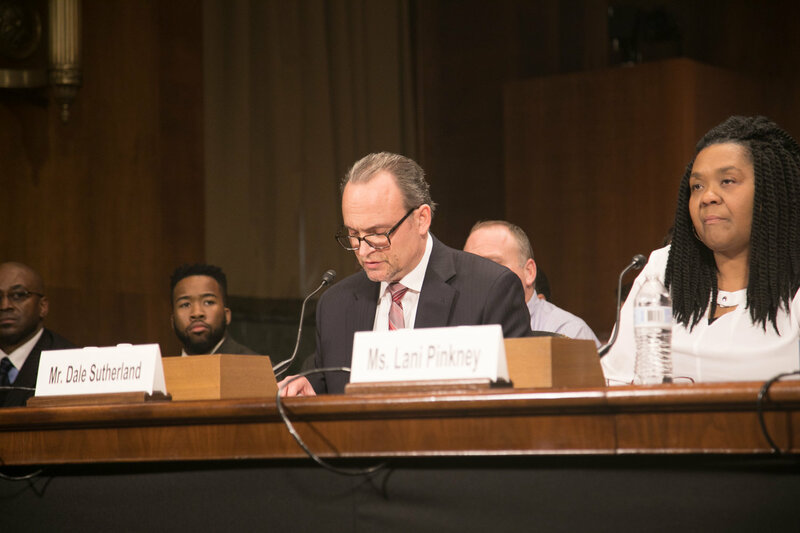 Code 3 Founder & President Dale Sutherland testifying before the U.S. Senate Subcommittee on Crime and Terrorism on January 17, 2018 about the long-term care needs of injured first responders.